A few weeks ago, my dear friend Yvonne was visiting us from Washington. 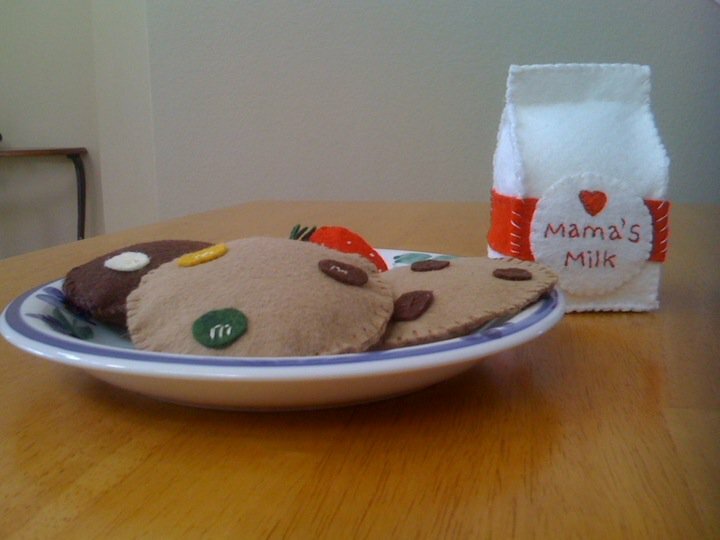 I had just started my felt food kick, and though that is not her chosen craft, Yvonne jumped right in. She designing this adorable carton, and at my hubby's suggestion, made the logo for "Mama's Milk" rather than cow milk, which my son doesn't drink. I've never been a huge fan of milk myself, and my mom can attest I went through a phase as a teenager where I didn't consume it. I think she thought I was silly, but obliged me and bought Tofutti Cuties and rice milk that summer. I also think it is important to remind ourselves we are mammals, too, and human babies deserve human milk (even if it's only the felt variety). Please head over to Cartolina Bella and check out Yvonne's real passion: beautiful handmade greeting cards! Next comes the logo. I wrote out free hand with a pen. Be sure to mark gently or use a disappearing ink pen so that the wording doesn't show through once embroidered. This took me a few tries before I got it how I wanted it, so you may end up cutting out an extra white circle or two. 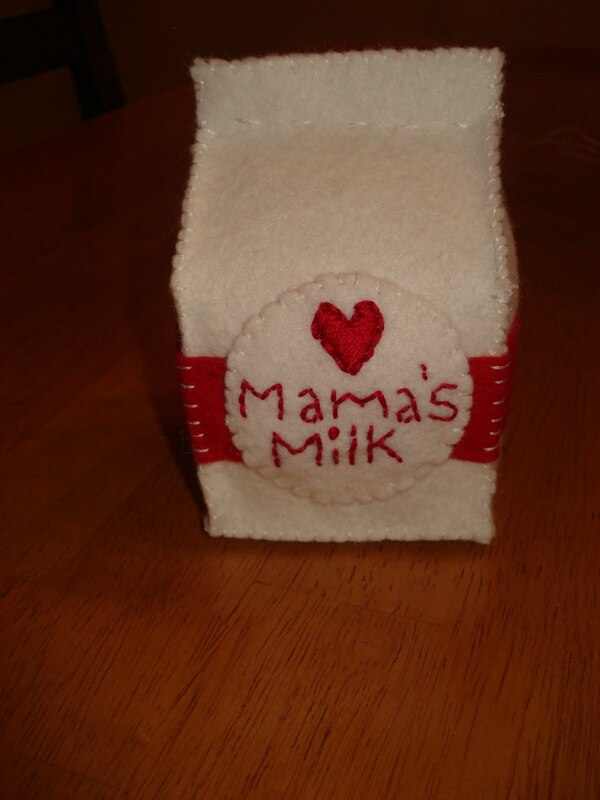 Of course you could also leave off the "Mama's" and just put "Milk" if you feel so inclined. 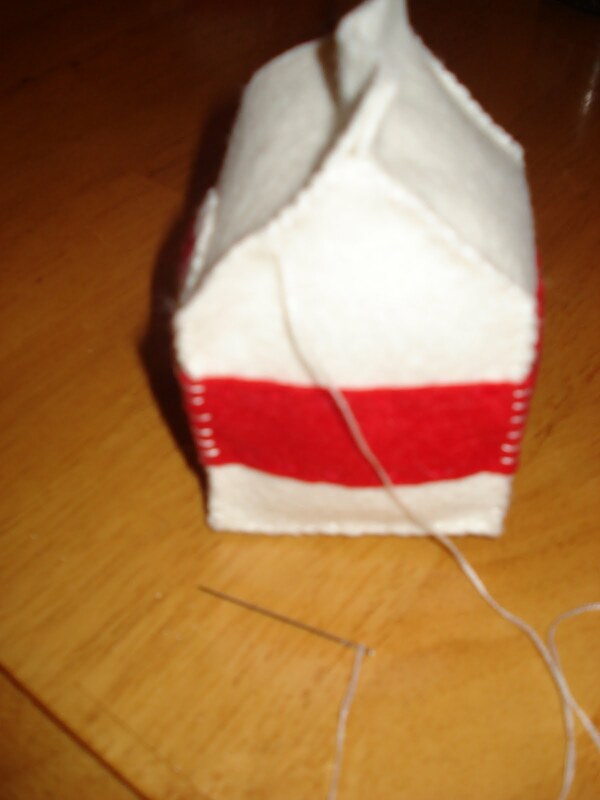 Using white thread, stitch up all four sides, just until you meet the "roof" of the house pieces, leaving the top open. Measuring to make sure it is even (this is .75 inch from the bottom), pin the red ribbon piece around the carton. Keep the edge of the ribbon in the corner of the house piece furthest from the front rectangle where the logo will attach. 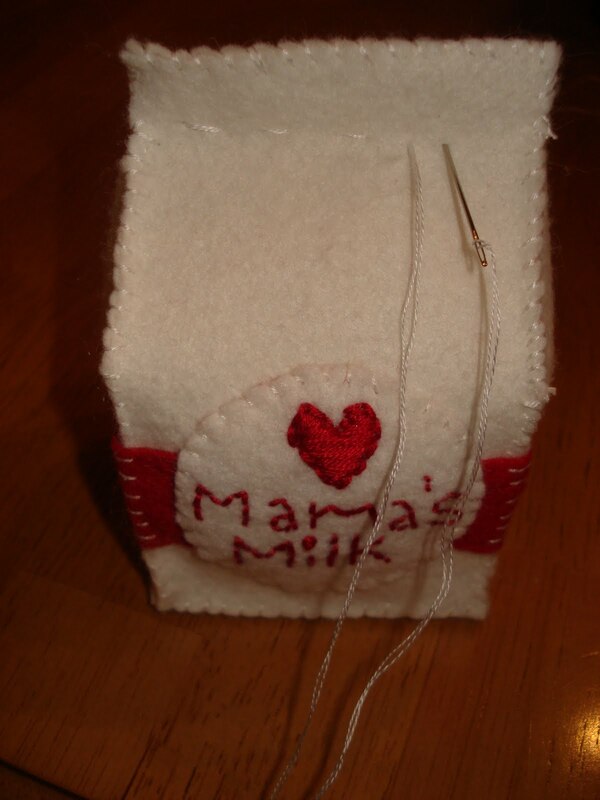 Using a running stitch, attach the bottom of the ribbon all the way around the carton. Then attach the top of the ribbon to the carton. Now, we whip stitch the logo to the front of the carton using white thread. Attach the corners of the ribbon with white thread for a cute accent. Now that we are done with the decoration, back to construction! Add stuffing to the carton. Working from the corners of the "roof", stitch the front panel to the side panel, leaving about a .5 inch up top where the front and back panels meet, forming the carton tab. I apologize for the blurriness of this picture. Apparently I took no good photos of this step. Stitch along the top and sides of the carton tab. 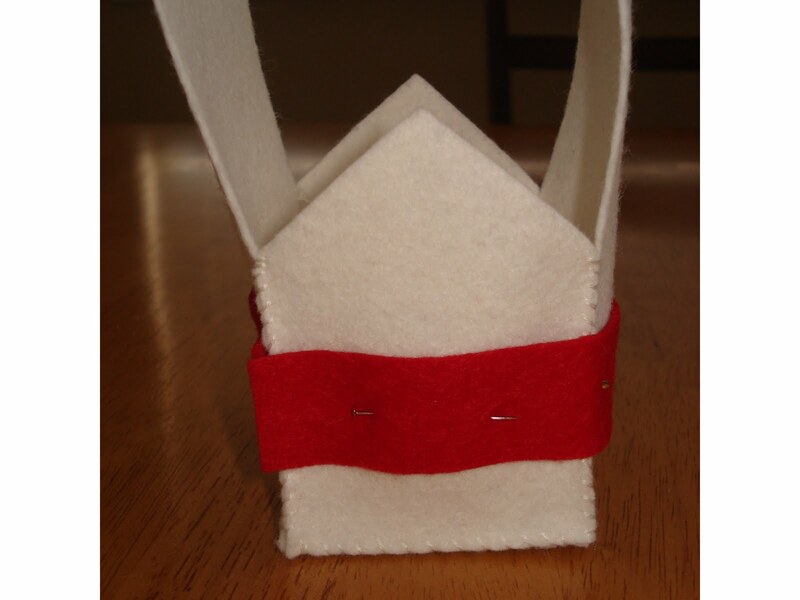 Lastly, do a running stitch along the bottom of the carton tab, even with the tops of the "roof" pieces. And our carton is done! Perfect for the mama's milk drinker in your life! Happy Felt Fooding and thanks again for the pattern, Yvonne! Too cute!!! Thank you for sharing!!!! Oh my goodness - this is so sweet it made me cry. Please feel free to leave a comment or a question!